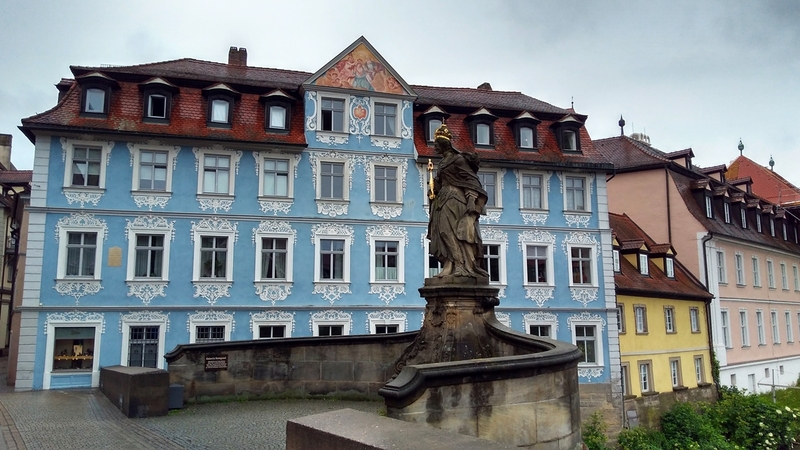 Bamberg is a splendid example of a central European city with a medieval centre. Located between Würzburg and Bayreuth in northern Bavaria, it offers well-maintained historical buildings, water in the form of the river Regnitz and countless nice places to stroll around, eat or drink. 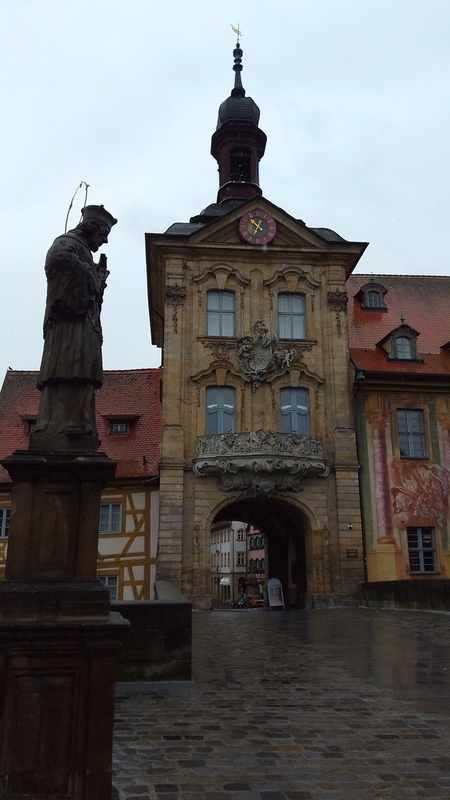 When I visited Bamberg, I was extremely unlucky, weatherwise: It was raining cats and dogs and just wouldn’t stop. 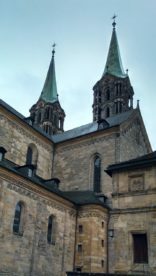 Not the best conditions for sightseeing or taking photos, so I will definitely have to undertake another visit at some stage. 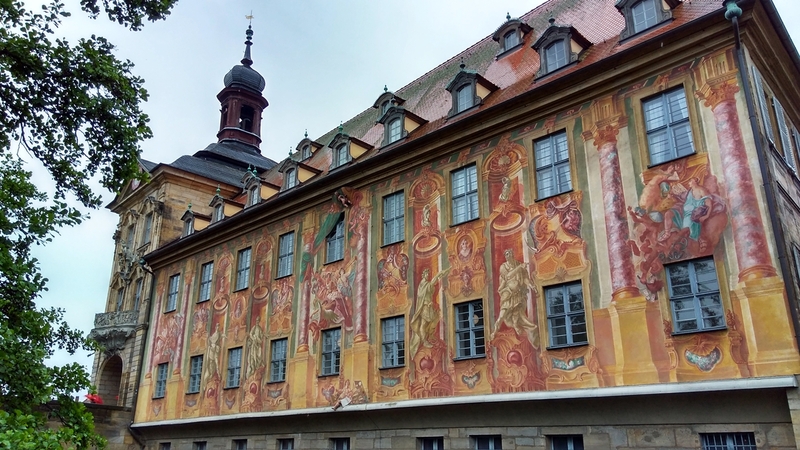 I learned that Bamberg was a very important town in the medieval and early modern eras, due to its links to the Slav peoples and – with growing prosperity and massive building projects – its architectural influence on other central European countries. 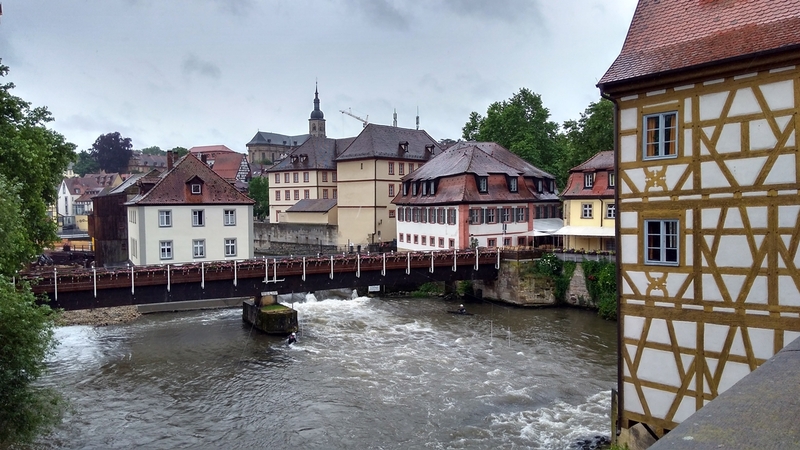 I definitely wouldn’t have expected this, before coming here – to my shame, I had somehow always thought of Bamberg as just another example of a medieval town. How wrong one can be! 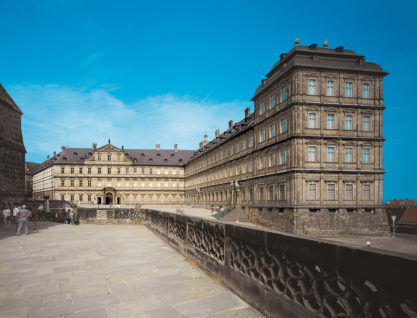 In the 18th century, Bamberg became a centre of the Enlightenment and was home to such famous figures as the philosopher Georg Wilhelm Friedrich Hegel and the writer E.T.A. Hoffmann. I was in for another surprise, there. 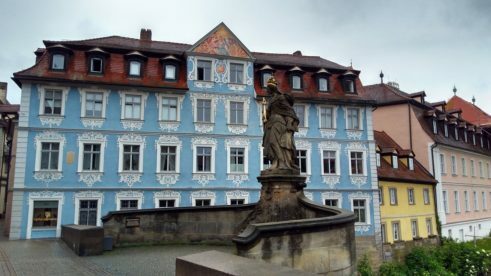 The World Heritage area in Bamberg is distributed over three parts of the city: the Bergstadt (hill city), the Inselstadt (island city) and the Gärtnerstadt (market gardeners’ district). In addition to the architectural heritage, Bamberg houses three documents which are part of the world’s documentary heritage. 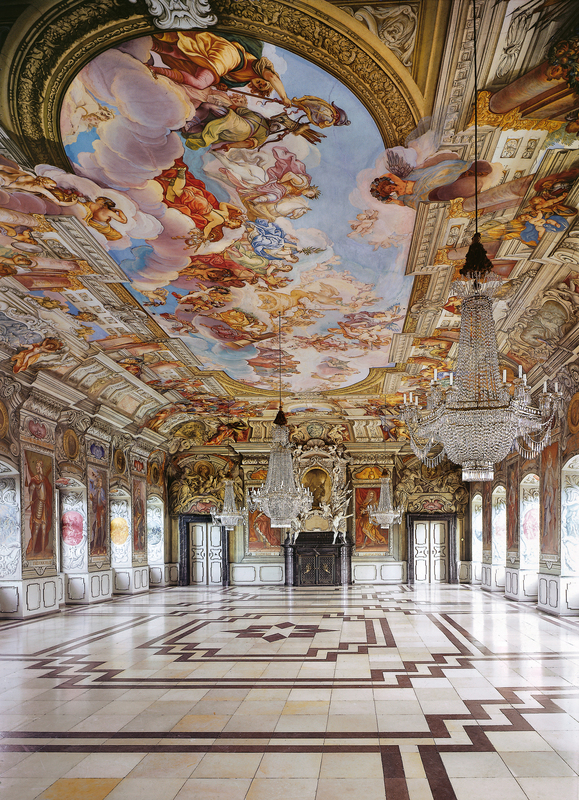 Information on those can be found in the entrance hall of the Staatsbibliothek Bamberg (i.e. the state library). 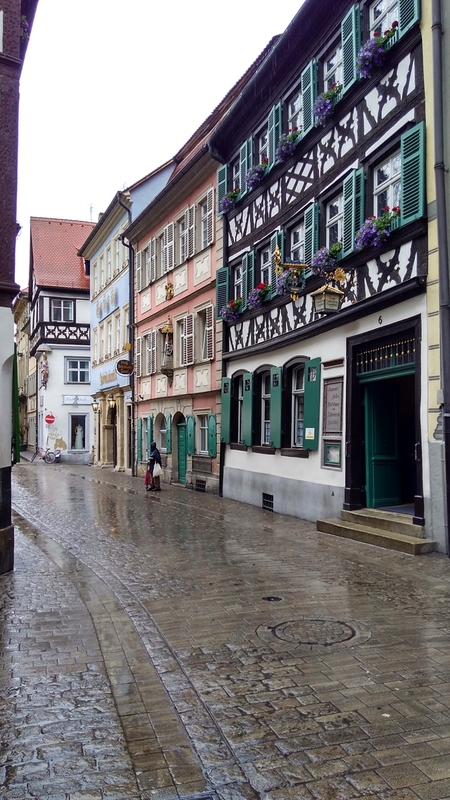 Due to the never-ending downpour, I couldn’t leisurely stroll through the historic centre as planned, but very nearly jogged through it. 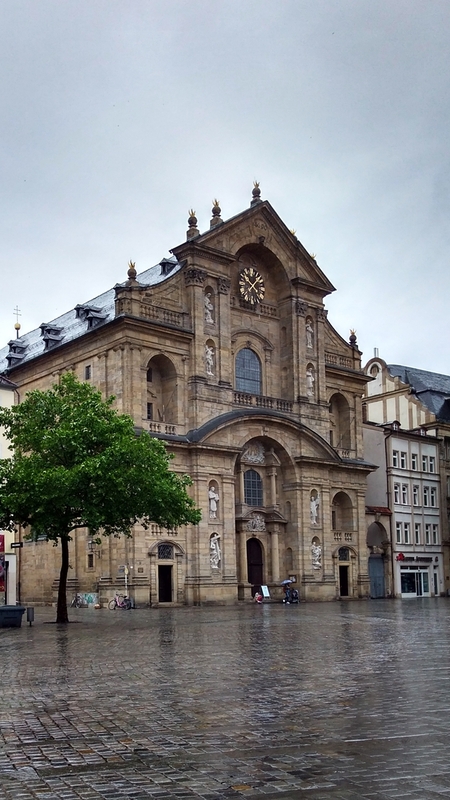 Despite the lack of fun in that, the special atmosphere of the historic centre still shone through. I hope that the few photos I managed to take can actually convey what a pretty city Bamberg is. Apart from the very well maintained historic buildings, Bamberg has a number of cafes and restaurants on offer, so it is possible to intersperse sightseeing with breaks. I imagine this to be especially nice on a sunny day, when you can actually sit outside. 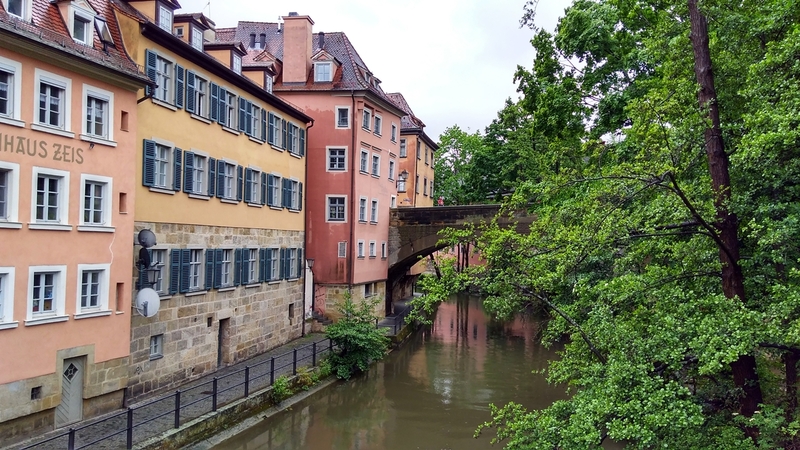 Another definite bonus in my eyes is the proximity of water in the form of the river Regnitz. 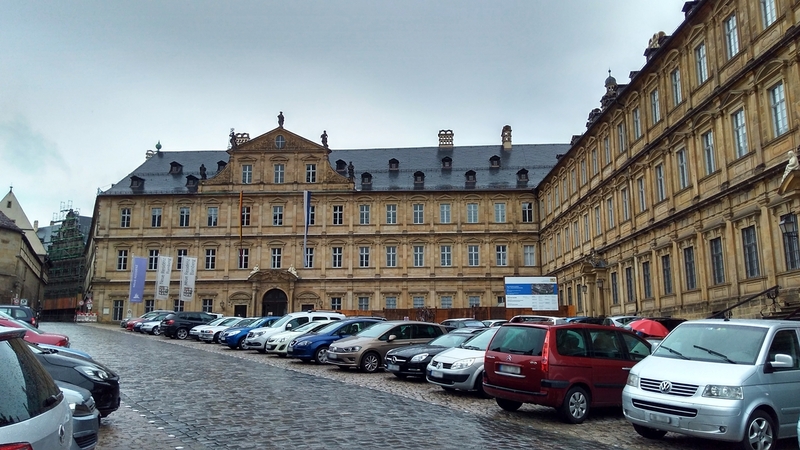 One thing annoyed me immensely, though: I cannot for the life of me fathom why city planners would situate huge, ugly parking lots in front of some of the most beautiful historic buildings. I know that space is hard to come by in cities, but surely there has to be another solution, rather than have all those cars blemish the views of the historic town centre? 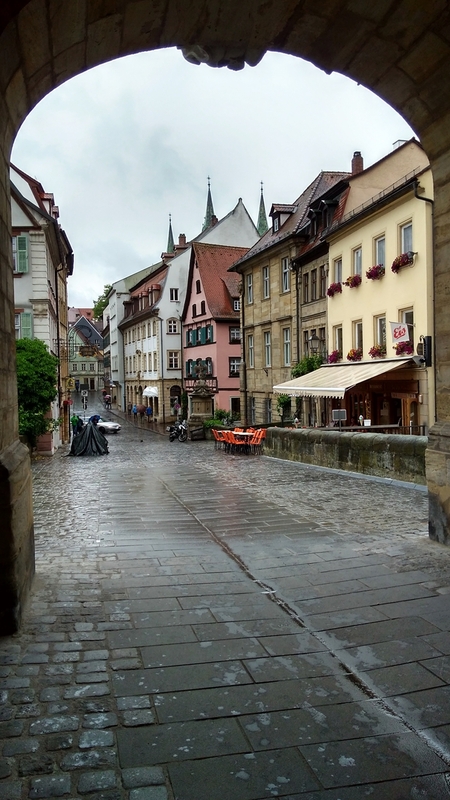 Even though I couldn’t enjoy my trip to Bamberg as much as I had hoped due to the poor weather and the necessity of catching an early-ish train, I can say that it is well worth visiting. I would like to thank the Bayerische Verwaltung der staatlichen Schlösser, Gärten und Seen for granting me a photo permit for exterior photographs of the New Residence and the Old Court and for providing two photos of the New Residence (see captions above for details).